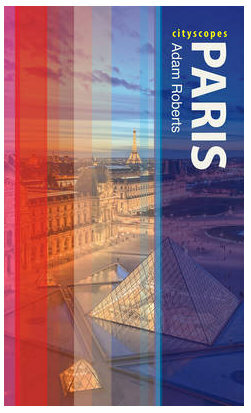 With an exhibition on the later works of the artist Raphael currently running at the Louvre, it is interesting to note an earlier link between the renaissance painter and Paris. 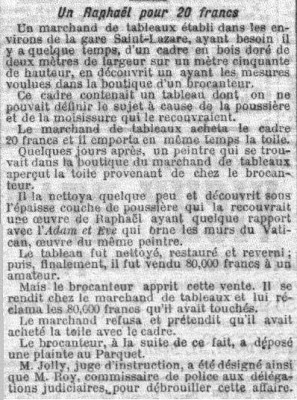 An article published in the Petit Parisien newspaper on Feb 2nd, 1899 describes a disagreement between a secondhand goods trader and an art dealer - with a picture by Raphael at the heart of their discussion! The adventure began when the art dealer went in search of a wooden frame with very specific measurements. He found exactly what he was looking for in the secondhand goods trader's shop, and purchased the frame - which still contained a very dusty and mouldy painting - for the very minimal sum of 20 francs. A few days later, a painter (the article is very short on names and specifics!) visited the art dealer's shop and spotted the frame and painting. 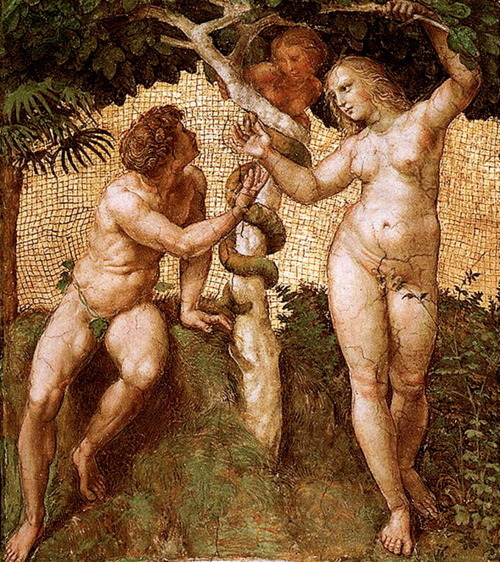 After clearing away some of the dust and grime from the picture, he declared it to be a creation by Raphael that had some link to his Adam and Eve painting that hangs in the Vatican. After the painting was cleaned up and restored it was eventually sold to a collector for 80,000 francs. 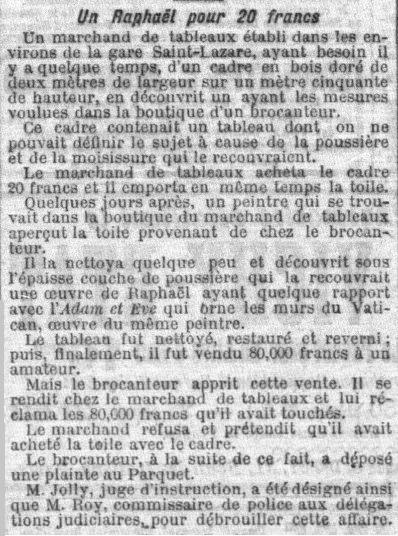 A very healthy profit for the dealer, but also seemingly a very cheap price for a Raphael (by my estimations, 80,000 francs in 1899 is the equivilent of around 300,000 Euros today). Naturally the story didn't end there. The secondhand trader got wind of the sale and immediately went to the dealer to ask for the money he had received for the painting. The dealer refused, claiming that the picture had come free with the frame. Given the impasse, the disagreement was taken to the law courts for deliberation, but here the article ends and I can find no further trace of this case. Was this a genuine Raphael, and if so how did it get to Paris and into such a sad state, and where is the painting today? Who eventually profited from the lucky find? If anyone has any answers please don't hesitate to let me know!